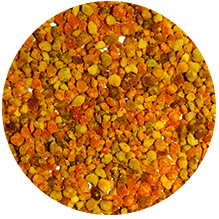 Bee pollen consists of a mixture of flower pollen, honeybee digestive juices, and nectar. It has been used in certain cultures for thousands of years, but has become increasingly popular over recent years and recognized for its potential health benefits. Has been used therapeutically for asthma, allergic conditions, impotence, bleeding stomach ulcers, altitude sickness. As a dietary supplement it has been used for high cholesterol, and cardiac conditions. No clear scientific evidence available. Contains powerful antioxidants: packed vitamin B, zinc and iron. 10-15 gram (2-3 tablespoons) daily. For allergy prevention all that is required is about one teaspoon per day. You should gradually increase your dose to one tablespoon. It will give about five grams of protein which is a good addition to a balanced diet.